If you enjoy the flavors of the Southwest, this barbeque brisket rub will become one of your favorites. Including cumin, oregano and cayenne, this dry rub adds a lot of great flavors to your beef brisket. Combine all of the ingredients, seasoning the brisket 12 to 24 hours before cooking on the grill or in the smoker. To help the rub adhere, I sometimes coat the meat with a little olive oil or vegetable oil before shaking it on. 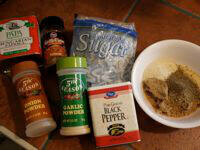 This dry rub mix will keep for several weeks in an airtight container.